Original 1962 rendering by architect, R. Burley of Saarinen/Kiley design showing one block bridge solution. Wofford and Schultz view, favored by surviving Saarinen collaborators. 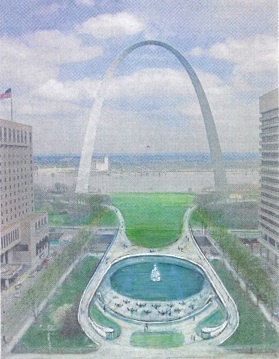 When the area now known as Laclede’s Landing was threatened with demolition in the mid 1970s for a development that would have been visually competitive with the new Gateway Arch, we first presented our landscaped pedestrian bridge concept tying the Jefferson National Expansion Memorial grounds to the Old Courthouse. This was one element of a pro bono study that ultimately involved the entire riverfront and included the area to the south of the Poplar Street Bridge that we called Chouteau’s Landing. We proposed an aquarium, among other amenities for that site. Our premise was that strong and vibrant attractions at each end of the Park, if made easily and graciously accessible, would generate movement through the Park and appreciation of its uniquely dynamic landscape qualities and views. 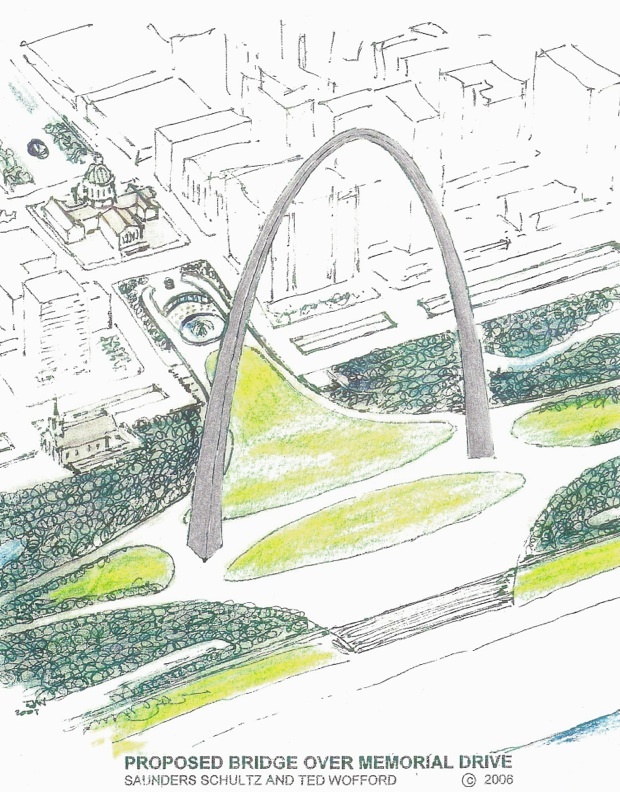 Having worked with both Eero Saarinen and Dan Kiley we knew that the pedestrian link to the Old Courthouse was important to them, as was the appropriately scaled development of the East side of the river that would complete their grand concept. These designs have continued to be refined by us over many years and have been presented to the press, public, and to the National Park Service. They have been cordially received – then ignored and forgotten. Although the recent competition sought to address many of the points we raised over 30 years ago, that doubtful exercise was so restrictively structured that neither we, nor in fact if they were still alive, even Saarinen and Kiley, could have qualified to enter. This conclusion was confirmed by the architects who worked with Saarinen and his daughter, landscape architect Susan Saarinen. We have patiently waited for the publication of the proposed designs for the riverfront because we believed that our response as dedicated design professionals with many years of experience, needed to be based on fact rather than upon speculation. While incomplete (what has been released is sadly lacking in detail) enough is now known to raise serious questions. For the good of our community, these concerns deserve thoughtful consideration. At the time of release, interested citizens were told that there would be no questions or comments allowed, so we are taking this public route to open the discussion. This is a huge financial investment at a time of scarce funds and this city and region will have to live with what is decided for another 50 years, or more. 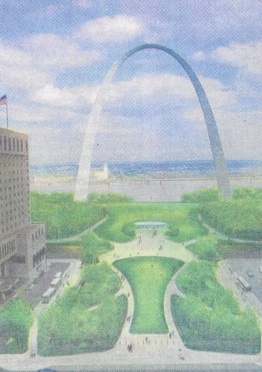 The drawing published in the Post-Dispatch on 01.26.2012 titled “Current” view shows the cut off stubs of the original Saarinen-Kiley walks where those handsome curving lanes emerge from the trees. 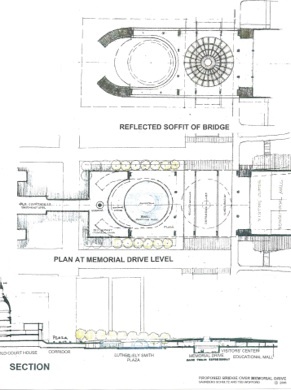 It was the intent of Saarinen and Kiley that the dynamically curved pedestrian walk system would continue, extending over the existing earthen berm to bridge across Memorial Drive and provide safe pedestrian access between the Old Courthouse and the Park. Such a connection does not require altering the existing traffic system, or making an enormously expensive and potentially problematic tunnel out of the depressed highway. It would organically extend the landscape design of the grounds westward to the Old Courthouse that is included in the existing National Park. In our proposal the underground museum is extended westward to a welcoming glass front at the Memorial Drive level between the abutments of the landscaped bridge above to provide a highly visible public street face for the museum which does not compete with the Arch. On the west side of the street, Luther Ely Smith Park (with added recognition of Dred Scott) is expanded at the Memorial Drive level to accommodate a large pool, fountain (ice skating in the winter) and related plaza. 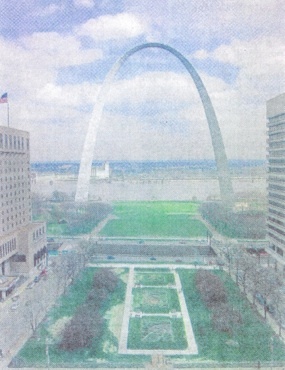 Outdoor and indoor dining and other activities oriented toward the Arch would allow sunlight and street life to enliven the view from Memorial Drive. Quite apart from the high-cost, engineering challenges and traffic complications involved in eliminating or altering Memorial Drive in a major way, far more citizens experience the majesty of the Gateway Arch from their automobiles on Memorial Drive than make the effort to visit it on foot. Any connection to the Old Courthouse, by its form and integration into the existing design should have a sense of directness and unity with the landscape of the Park grounds. These qualities are totally lacking in the rendering from the Post-Dispatch’s titled “Future” view. 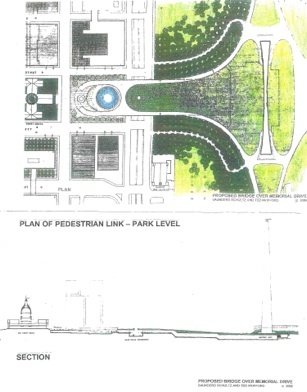 What is shown there seems to meander and is ambiguous as to the resolution of the grade differences that exist between the Old Courthouse and the proposed “lid” over Memorial Drive. There is too much happening visually, and too few factual answers available to even comprehend the intent. At least there is a directness, simplicity and sense of unity in the “Current” view that we believe is retained, strengthened and given new meaning in our “Bridge Proposal” as illustrated in the identical format to that of the Post-Dispatch renderings. Almost all of the surviving architects who worked with Saarinen at the time of the Arch design and construction have endorsed our efforts and have considered our designs consistent with the desires expressed to their closest associates by both Saarinen and Kiley. 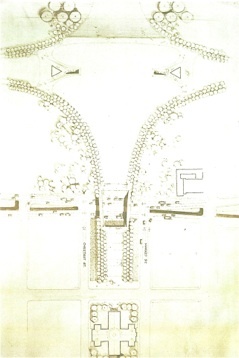 Copies of sketches of the pedestrian link as proposed by Saarinen, Kiley and Robert Burley, the architect that Saarinen chose as Designer-in-Charge of the Jefferson National Expansion and Arch, exist. We had no knowledge of their existence until many years after we designed our version of that very connection. The planned alterations to Memorial Drive are just the tip of the iceberg of the fatally flawed current Riverfront Proposal. However, because it appears to be the highest priority item to move forward, that proposed design needs to be addressed quickly. We heartily agree with Ralph’s appraisal as well as so many of the architects who have collaborated with Eero Saarinen. 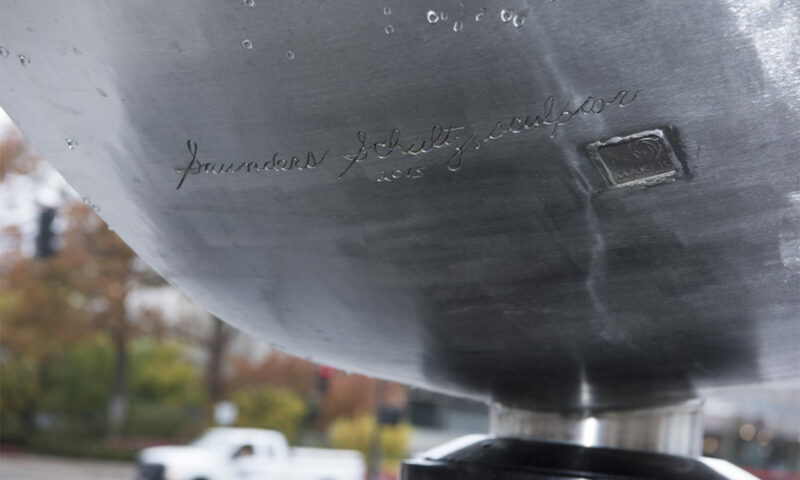 We have devoted over 30 years and a great amount of our money to this effort to honor and help save this unique masterpiece -the internationally respected symbol and signature of St. Louis.